I can hardly believe it, but it's finally finished. I feel like I have a lot to say, so here's the fraction I'll be able to get out. When I started this chapter, I didn't plan for it to be this long, to be the length and workload of two graphic novels, to spend more than three years chipping away at it. Over the course of those years it's had its ups and downs. I've felt discouraged and inspired. I developed a chronic wrist injury. I've moved across the country, formed new friendships, and changed significantly as a person and an artist. This chapter, all its jokes and twists and turns and silly dodgeball games, has been the background noise of my life for what feels like forever. I'm so, so glad it's done, proud of what I made but even more that I made it, and so, so, so excited for everything that comes next. First, I have a bunch of amazing guest content, art and comics, that I'm so super excited and grateful for that will start going up on Friday! I can't wait for you guys to see them. Then, I'm going to take a break. I know how much how many of you look forward to Paranatural each week and how disappointing that might be to hear, so I'll do my best to communicate my situation honestly and in full. To be blunt, I'm exhausted! Working on the same segment of the same thing for years takes a lot out of you, and took a lot out of me. Because of my wrist injury, I had to ration my drawing time, spend almost all of it on Paranatural, and seriously cut back on things I enjoyed, like playing video games. I don't regret it, but it's been stifling. The incredible sense of pride and fulfillment I experienced when I was able to sneak in side projects like Terraform was enough to show me I needed to take some time for myself once I finished the chapter. Paranatural is my first love (and I am absolutely giddy about the ridiculous nonsense in chapter six), but, as a whole, it's a project I started as a teenager. I've changed a ton since I defined its scope, and even though I still enjoy making all-ages manga action comedy, I gotta spread my wings! I have a lot of art and stories in me that I want to get out, and I need some time to take a stab at them.The thought of trying to recalibrate for chapter six with travel for the holidays and my older brother's wedding (!!) on the horizon sealed the deal. So here's what's up: Paranatural will be on hiatus until the New Year, Tuesday, January 1st, 2019. I hope that's understandable, and I'm confident you all will be understanding. The support I've received when I had to skip updates because life got too busy or my wrist acted up, even the tacit support that is Not Sending Me A Mean Message, has been a genuine and essential relief. The fan art, fan projects, comments and excitement about Paranatural's characters have turned bad days into good ones for me more times than I can count. I've had negative interactions with readers, enough to keep me courting cynicism, but the positive, simple, everyday ones have been my backbone, a joy, and a constant reminder of why I'm going to keep making comics for years to come. So, for real, from the bottom of my heart, thanks for reading. Please continue to check the site for the next few weeks, the guest stuff is going to be great! 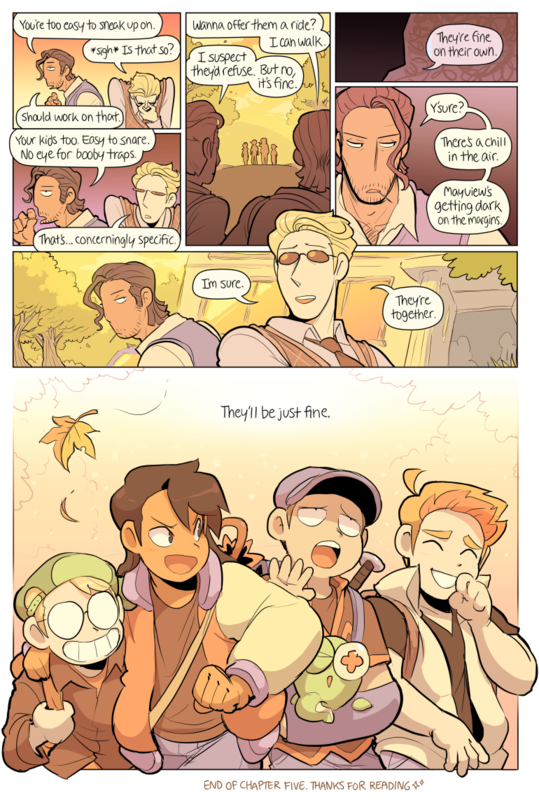 Also, now and while I'm on break, please consider sharing Paranatural with your friends! There's no better time for new readers to jump on, with five complete chapters in the archives, and any traffic while I'm away will help dampen the hit that taking a breather will have on the ad revenue I rely on. If you want to support Paranatural while I'm away, check out the Hiveworks store and, if you're able, consider backing me on Patreon! Any contribution helps and I'll be streaming and posting whatever I end up working on these next few months there for patrons. You can find and follow me on Twitter too, I'll be posting cool stuff there for sure as well! That's all! Thanks again for reading Paranatural and for reading all of this. To end on a happy note, here's a fun personal tidbit: last month I took up doing really basic qigong stretches once or twice a day, and the effect it's had on my wrist has been transformative. I don't know if it'd work for everyone or if it's only so miraculous for me because I wasn't doing enough before it, but thanks to that tiny change in routine I've had a huge streak of good wrist health and been able and excited to do a little drawing for fun again. It's been a fun sample of what a longer break could be, for recovery and creativity. I'm hopeful for my future, and Paranatural's, and I hope you all can be too.